Snapdeal Launches Affiliate Program; Offers 10% Flat Commission With Rs. 400 Limit! Snapdeal has now joined Flipkart and Amazon to have its own affiliate program. Though Snapdeal had a affiliate program previously, they offered it through third party affiliate network like Tyroo and OMG. Snapdeal’s own affiliate program had been in works for quite a long time, but it is only now that they have been able to launch it. Till date, Snapdeal usually offered between 4 to 8 percent commission to affiliate marketers through 3rd party networks, but with launch of its own program they are now offering 10 percent flat commission rate on all products. However, there is a huge downside which many affiliate marketers will frown upon – They have set the maximum commission payable at Rs. 400. So, any product sale that happens through affiliate channel priced over Rs. 4000, will still generate a maximum of Rs. 400 revenue to the affiliate marketer. 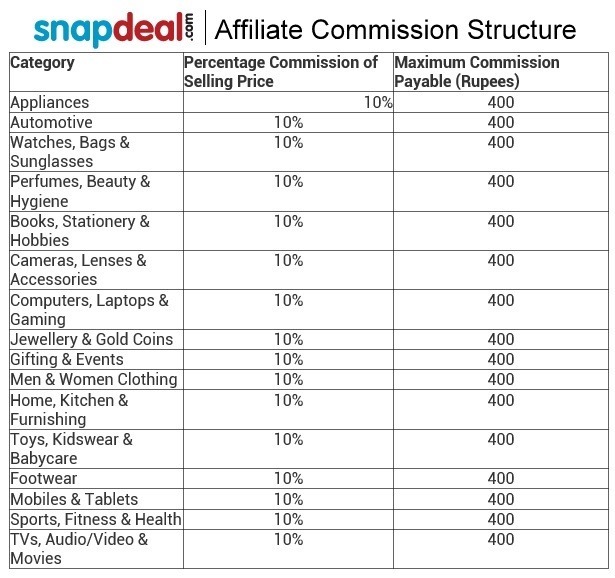 Here, take a look at Snapdeal’s affiliate commission structure. We registered for Snapdeal’s affiliate program in the morning, and got quickly approved. However, we just could not launch any screen after we got logged in. After trying for few hours, it was clear that it had something to do with Chrome browser that we were using. It loaded quite well on Internet Explorer (surprise, surprise..). Unlike Flipkart and Amazon, Snapdeal’s affiliate program is not straightforward. Generally, with most affiliate programs the marketer gets a unique ID, which has to be appended at the end of the product url that they are trying to promote. However, we could not find any such ID with Snapdeal (It may be possible that we may not have been allotted an ID as yet). 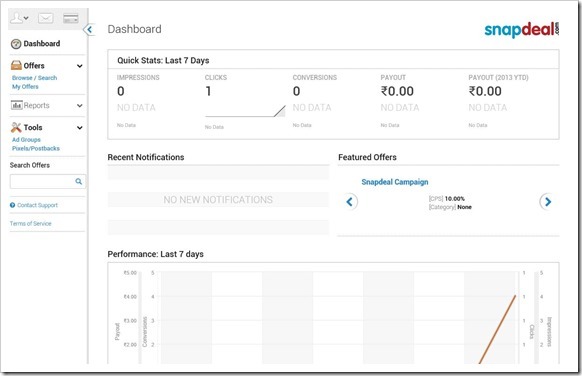 What I really liked are the analytics, as they show up in real time, so when marketers promotes a product, they can quickly know how many clicks and conversions have happened. Snapdeal has not officially announced the launch of their affiliate program, and there might still be few things that may be in pipeline. While we are happy about Snapdeal’s affiliate launch, the Rs. 400 limit on commission is sure going to be a deal breaker for marketers, especially when they are promoting high value products. Give it a try and let us know what you feel! OfficeChat: The New Private Messenger Mobile App For Your Business! is there any other affiliate program, who pay 10% commission on their all products ? What is minimum traffic required for Snapdeal Affiliate program. Snapdeal Affiliate program is a biggest scam. Please do not promote their program. I promoted their site for the last 4 months and did not pay me till date. I kept on asking for the payments and they said it will be paid soon, next moneth etc. Finally they blocked my account without giving any reason. Rs.4,00,000 was pending in my account. I am going to file a legal case against them. If anyone of you got scammed by them, please join me. Together we can fight this scam and make sure others will not get cheated by them. same happen to me, they dont pay me since feb 2015 until now nov 2015, always same excuse and never responding. Dont join snapdeal and flipkart affilaite program guys, they’re scammers. I have applier for their program and got rejected.Mine is an exclusive coupon site for which im using omg,tyroo till now. As snapdeal is nkt available woth 3rd party programs,the only way for me now is to register on their site but these fellows rejected.What might be the reason? Even though flipkart has its own affiliate program,they are promoting through 3rd parties also.